John C. Calhoun statue, Marion Square, Charleston, S.C. I can't help it. I grab every chance I can to make John C. Calhoun squirm in his grave. His statue is conveniently placed on a pedestal so high that if I get down very low I can entertain myself by taking pictures of him in awkward situations. 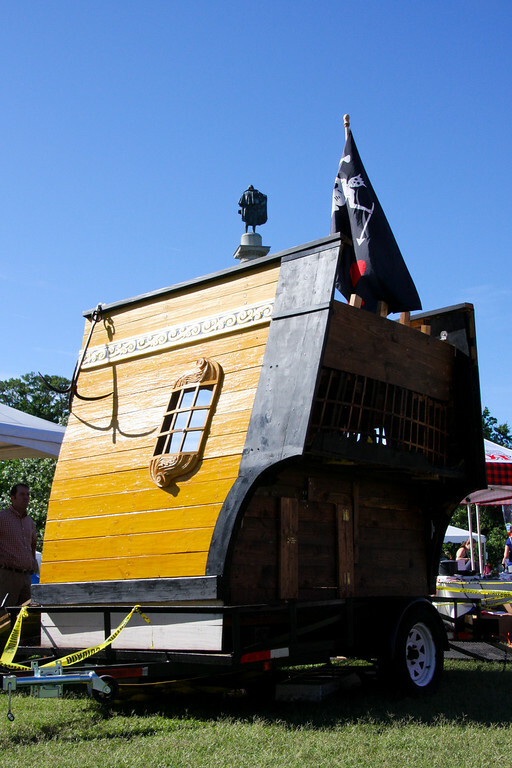 This time he sailed into town on a pirate ship. 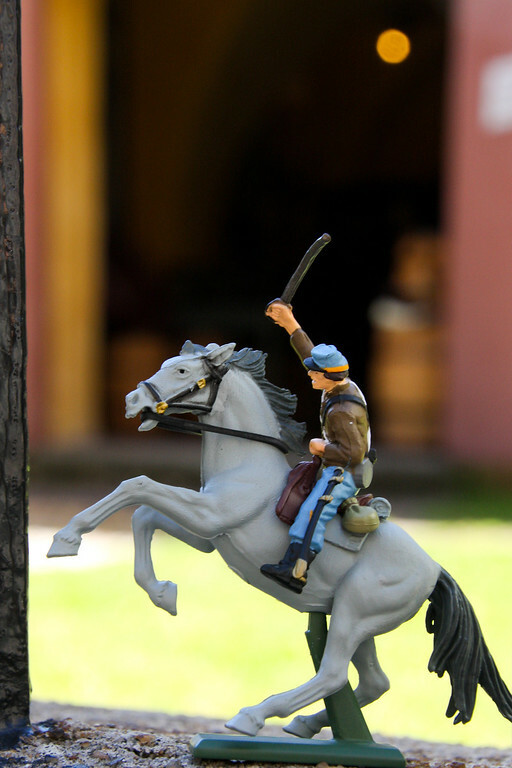 Check out the rest of the John C. Calhoun moments here. Maybe I'll do a show. Heheh. I enjoyed leftover Thai green curry and am back from my walk. It must be time for tea. Clearly I can have waaaaay too much fun by myself with a $5 plastic toy from the market. 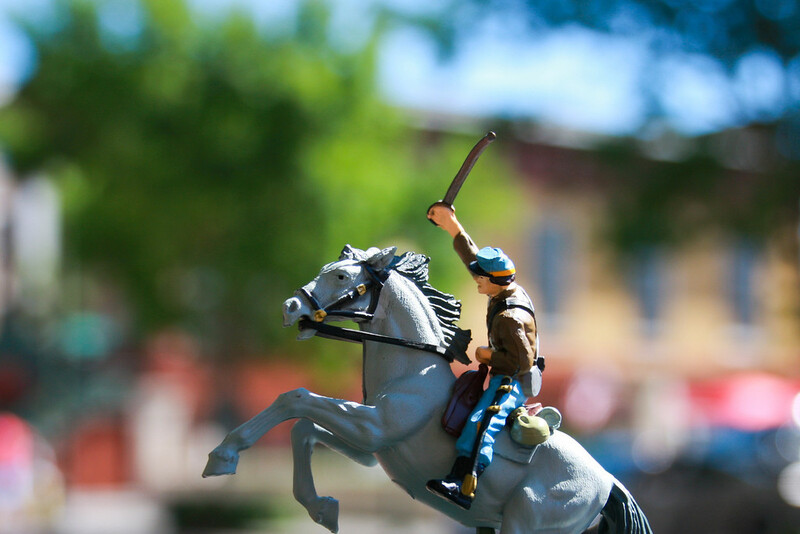 Tourists thought I was nuts posing my little plastic soldier for photographs as he insisted on galloping around Charleston. 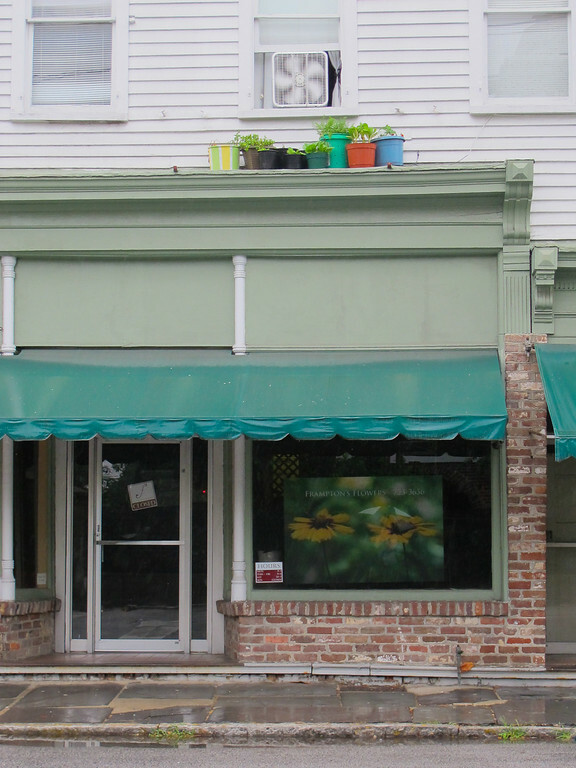 The first shot is in from of the Market building from Meeting St. and the second is in front of the powder magazine. I couldn't prop him on top of curved parking meters so I had to keep my eye out for newspaper boxes and there aren't too many of those. Goofy fun. 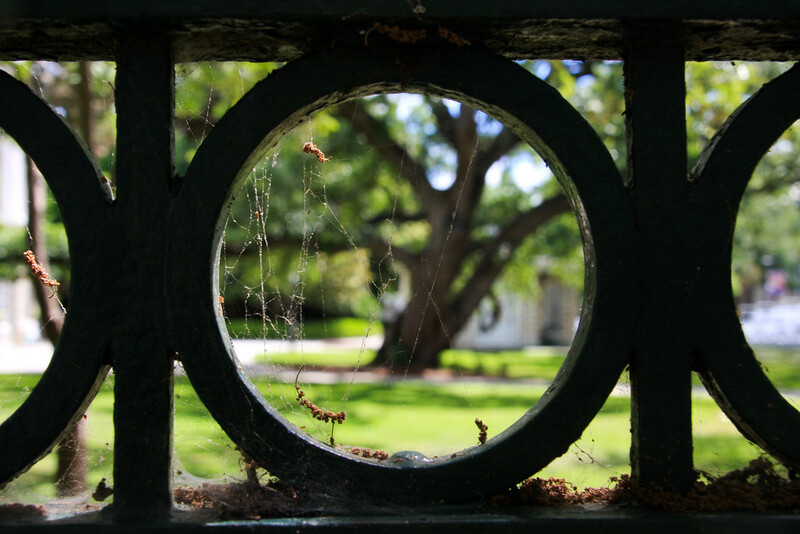 This fence made a pretty frame even if it is a bit cobwebby. This was taken through the iron fencing surrounding the Ashley Hall School for girls on Rutledge Avenue. 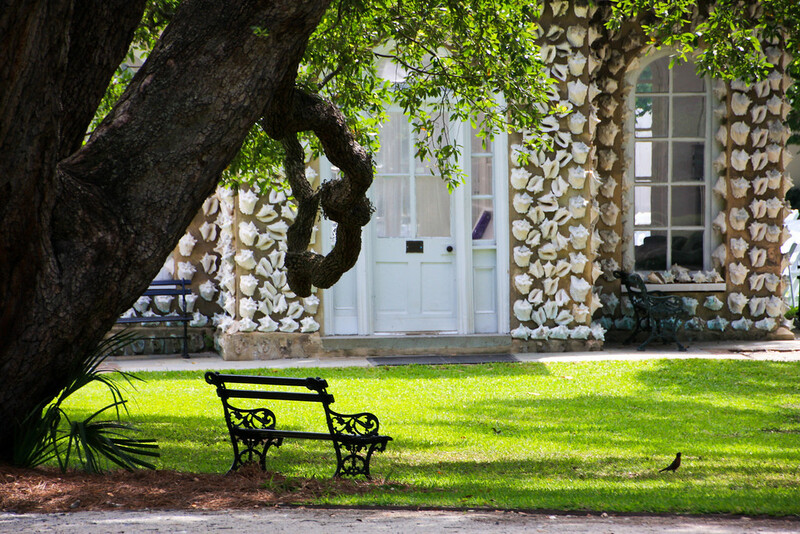 In the photo below you can see the shells on the shell house. How is everyone's week going? From all the posts around Charleston it feels like everyone but me is spending their days eating, drinking, partying and enjoying the Spoleto Festival while I've been cooped up in my office. Hmmmph. For someone who has a "people" job I seem to spend a lot of time at my desk clicking away at my keyboard. For the record, my school campus didn't look like this, did yours? Labels: Ashley Hall School for Girls, Rutledge Ave. 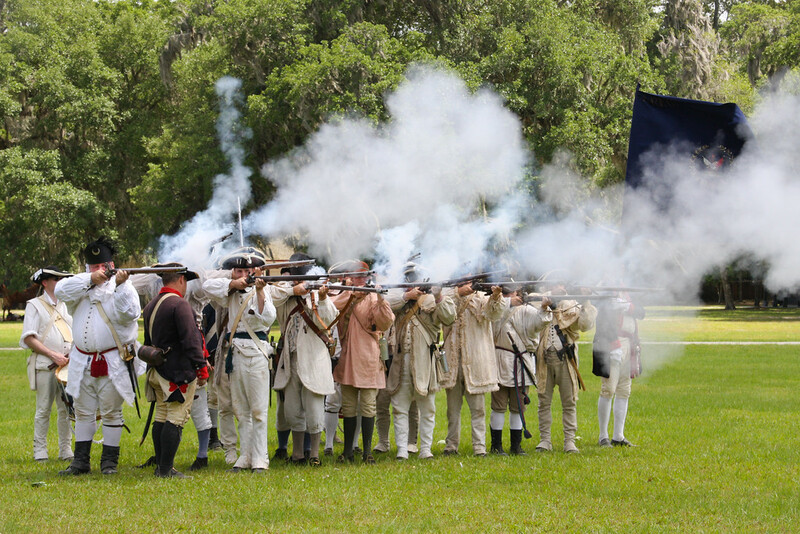 Revolutionary War re-enactment, Middleton Place, Charleston, S.C. 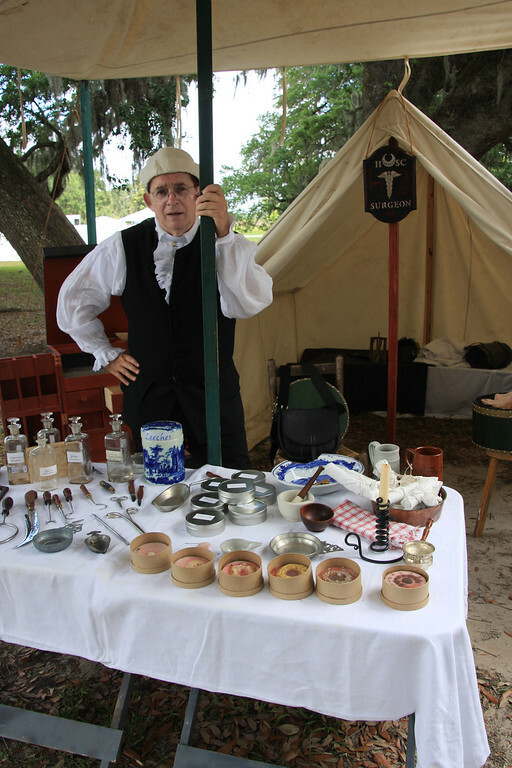 I soon discovered that re-enactment army surgeon Larry Tillman, at the encampment at Middleton Place this weekend is himself a medical school professor at the University of Tennessee at Chattanooga. Medicine has a little more to offer these days. At that time they were big on bleeding and purging. 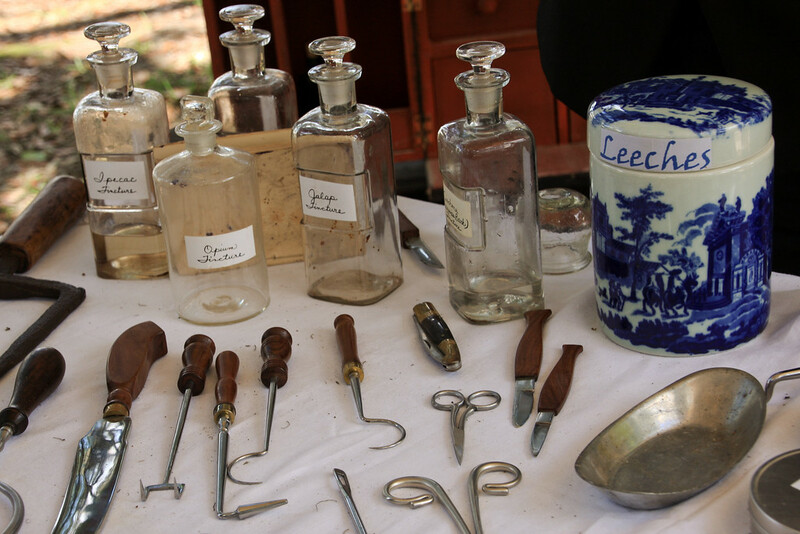 They seemed to want their patients leaking from everywhere....bleeding, purging, cupping and carefully placed leeches. If that didn't cure a soldier, they had hacksaws to cut something off. The round dishes in the front show the size of the vaccination wound from smallpox vaccinations at the time. Yikes. These are the good old days of medicine right now. I have the good doctor's email (oooops) address because I promised to send him a picture of an antique medical kit someone brought to me. I have a sneaky feeling what I have is more Civil War period. I don't see much evidence of kits in the 1780's. 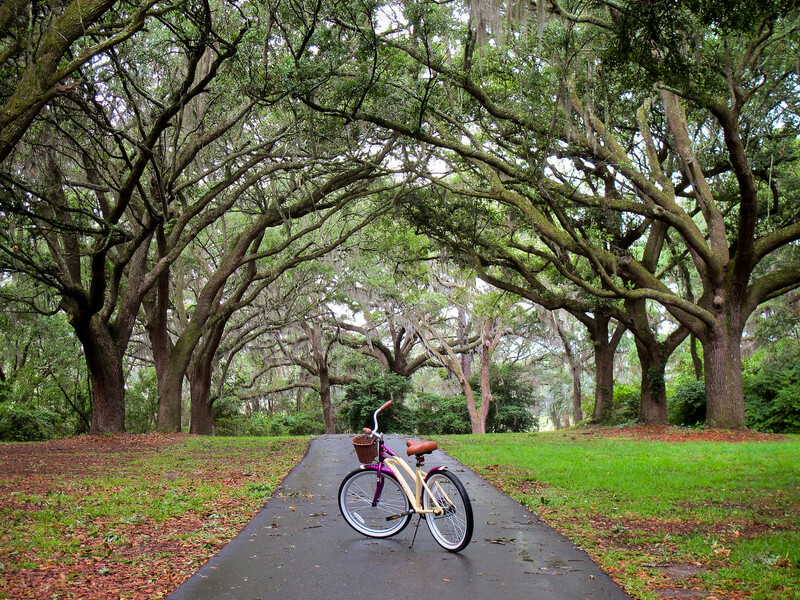 Avenue of Oaks at Charlestowne Landing, Charleston, S.C. Check out my new wheels! Nothing like a grand setting to show off a budget Walmart bike. Heheh. I've never been a bike rider but my new neighborhood is next to a bikeway, greenway and quiet neighborhoods so that may need to change. Last summer I took up kayaking so maybe this will be the year for two wheels. I started in a modest manner. This morning I figured out a way to cram the bike in the back of my car and went to zip around the peaceful pathways at Charlestowne Landing. 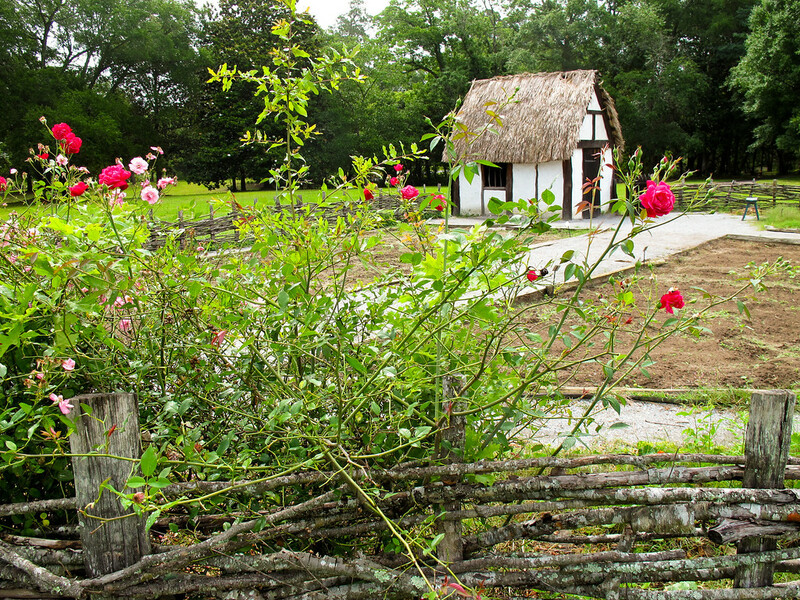 There was a brief rain shower and I took shelter in one of the historical cabins until it passed. It was lovely. I'll do this again. When my kids were little before the park was renovated they used to rent bikes here and I remembered what a great time that was. I hope everyone has had a good weekend. Twelve more hours and we'll be rushing off to work again scrambling to make up for the short week. It has been sweet while it lasted. 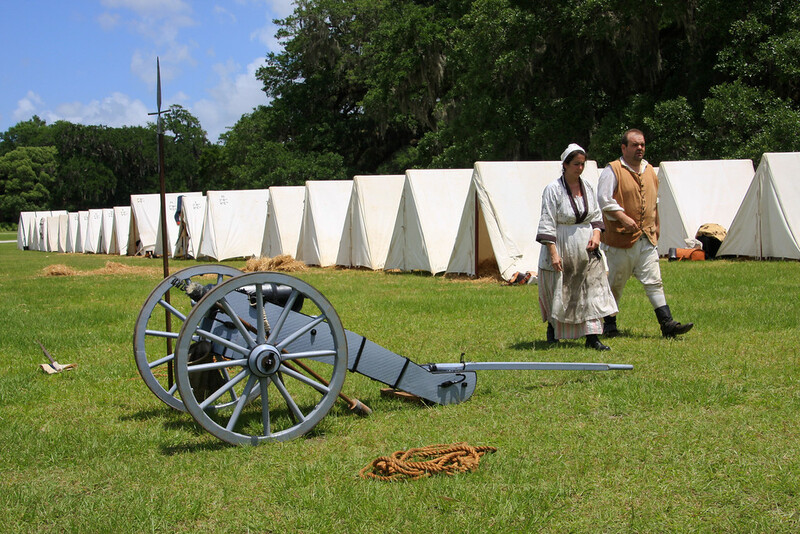 Revolutionary War reenactment, Middleton Place, Charleston, S.C.
Who can resist re-enacting a battle on a beautiful day like this? Aaaahh....I love the smell of fresh gun powder in the air. 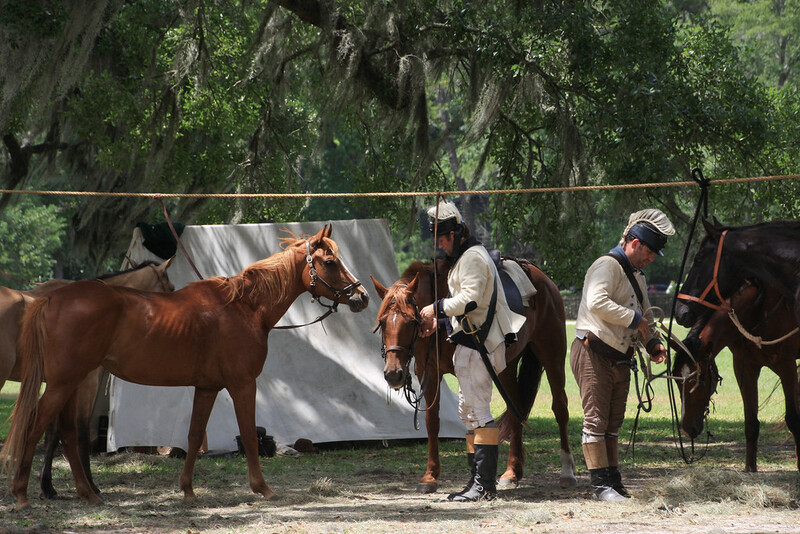 I went out to Middleton Plantation to see the costumed historians commemorate General Nathanael Greene's encampment of the southern army at Middleton Place during the Revolutionary War in 1782. 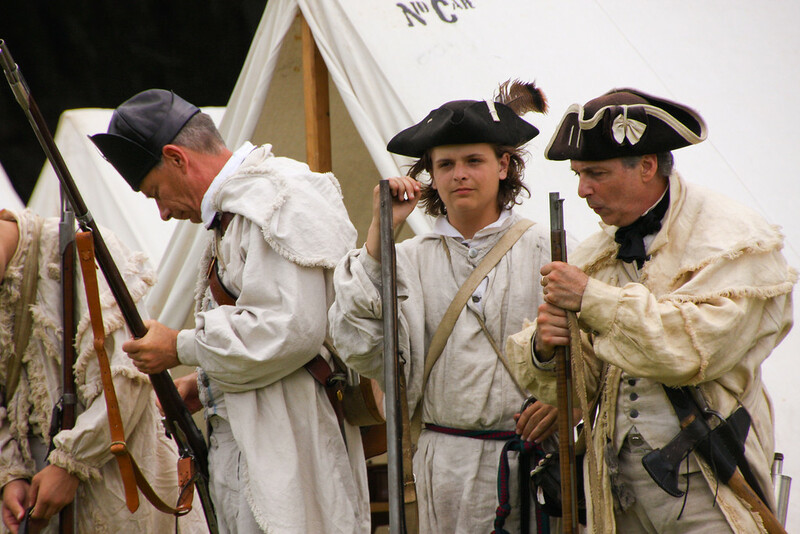 Living History Day: Contrary to popular belief, the majority of battles of the American Revolution were not fought in the Northeast, but in South Carolina. All told, there were over 500 engagements, large and small, fought in the state. New Jersey, with 300 engagements, is a distant second. 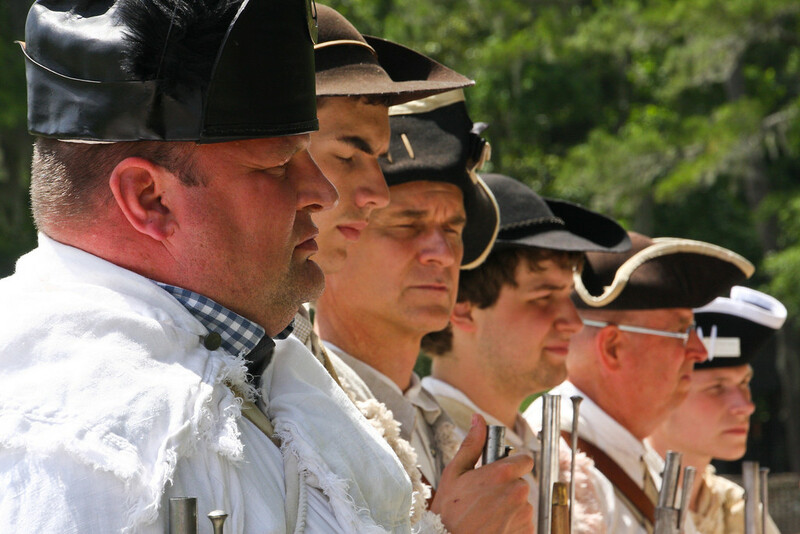 The American Revolution in South Carolina was a true civil war with neighbor against neighbor and brother against brother. 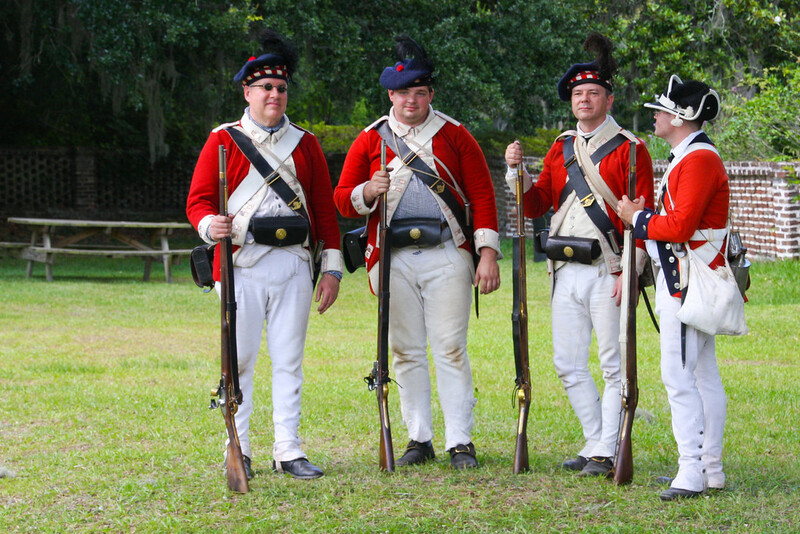 The largest number of patriot troops captured in a single engagement during the war came when Charleston fell to the British. 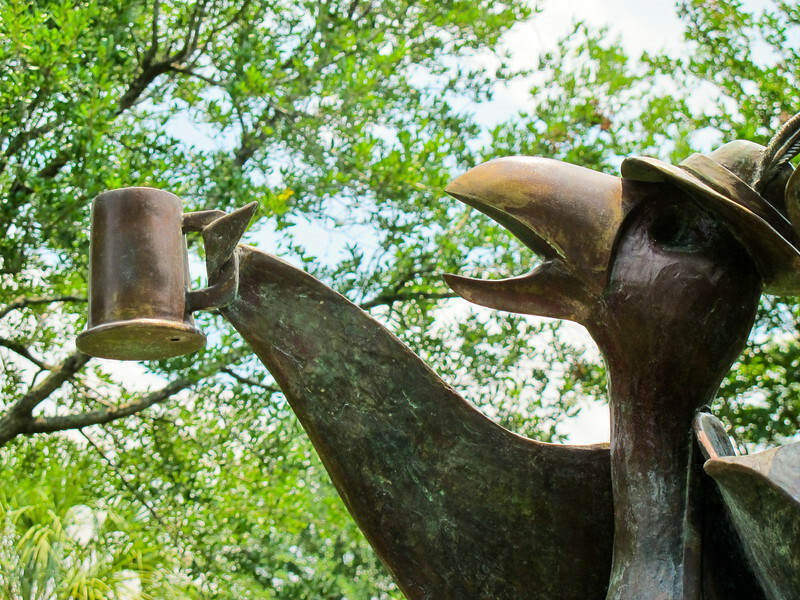 Soon thereafter, Arthur Middleton, a signer of the Declaration of Independence, who served in the defense of Charleston, was sent as a prisoner of war to St. Augustine, Florida. 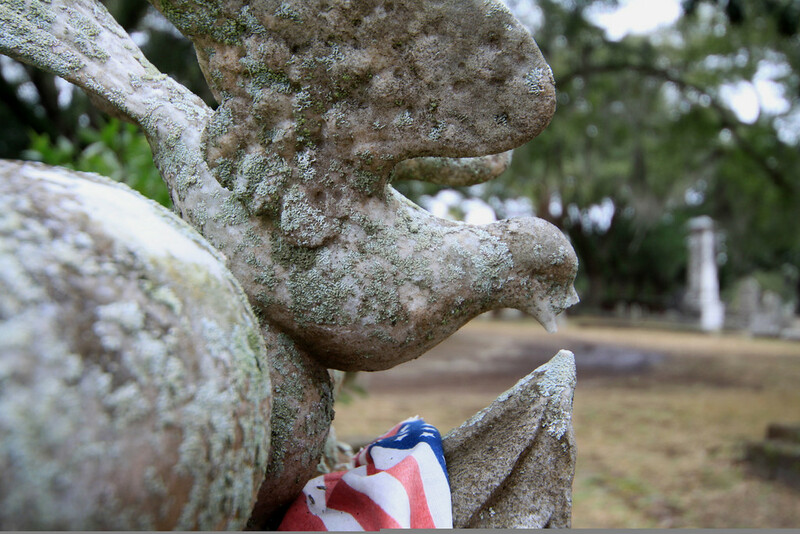 Many scholars say that the War for American Independence was won in South Carolina. 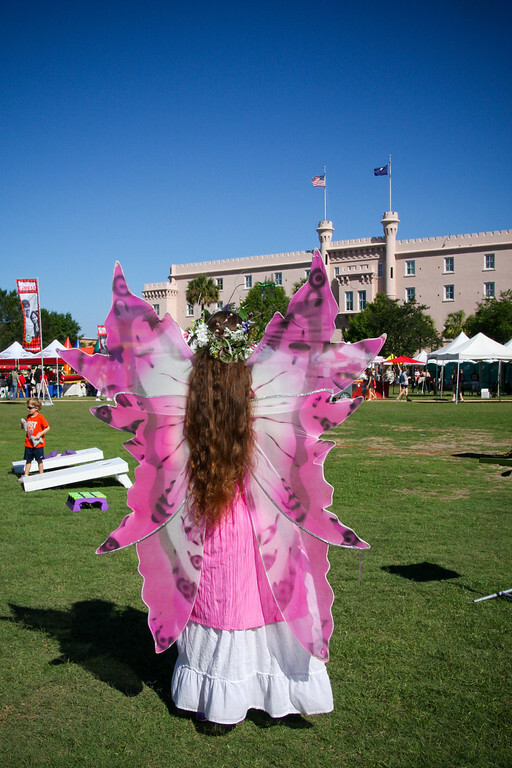 When Charleston throws an art party everyone comes. 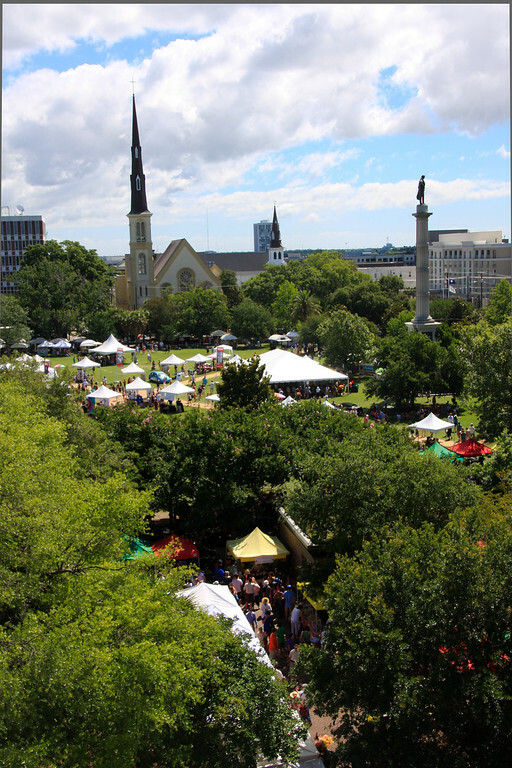 This is the art show combined with the Farmer's Market yesterday at Marion Square. Today is wild and windy out although the sun is shining brightly. There is so much going on this weekend but it's hard to tell when tropical storm Byrel is going to hit us with rain. 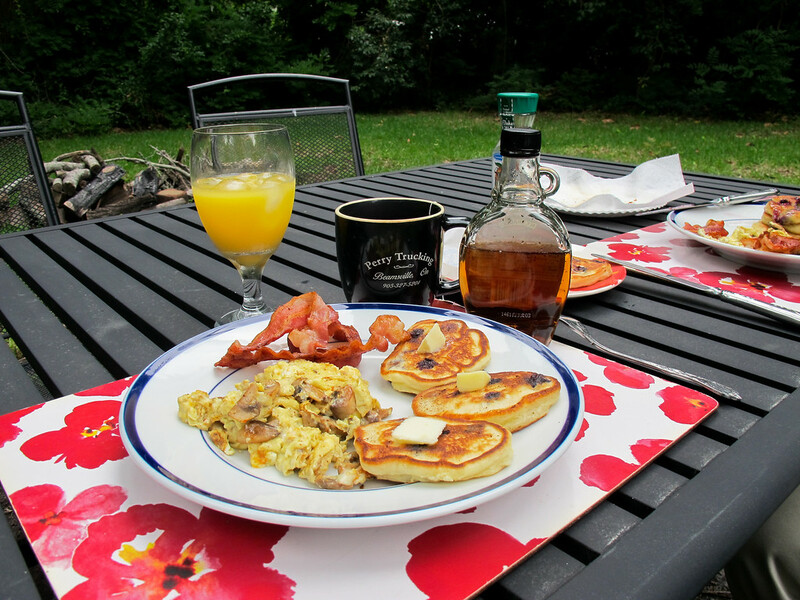 I just made brunch for my son and my handyman (gotta take care of a good handyman and mine is!) and after I clean up it just might be nap time. Sign, Vanderhorst St., Charleston, S.C.
What they offered must have been needed. 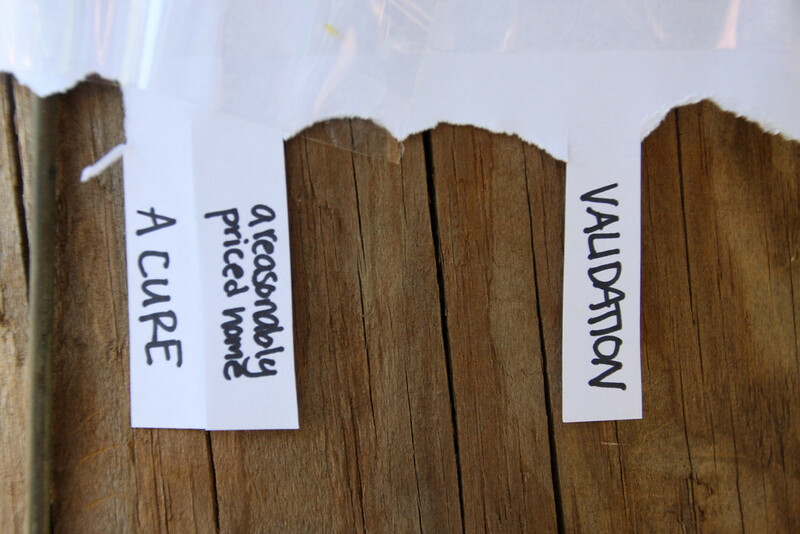 Most of the slips have been torn off. 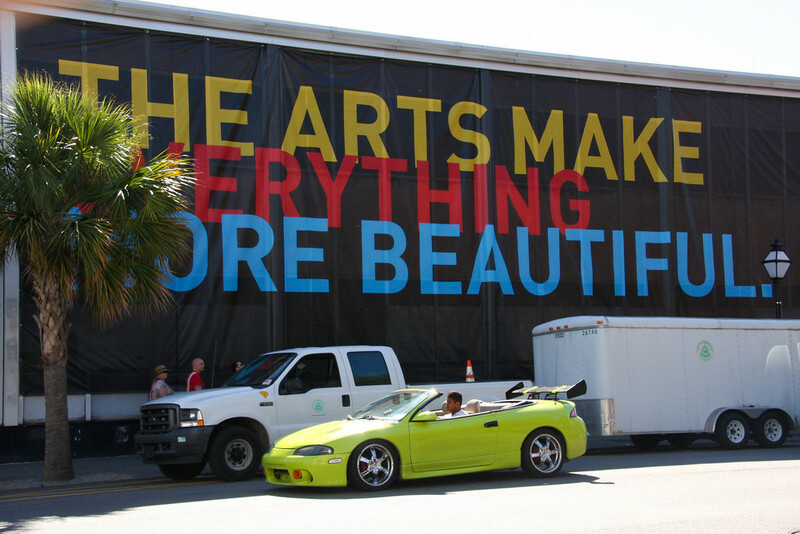 The Spoleto Festival has arrived. I've never actually been to the opening ceremonies since they are held in the middle of the day on a Friday. Here is a good break down of activities by Charleston Scene. I wandered through the Art Show in Marion Square as it was opening and everyone you pass seems primed to break into song and dance. Enjoy! I went to a luncheon sponsored by the good folks at Trident United Way today held at Pearlstine Distributors on Daniel Island. 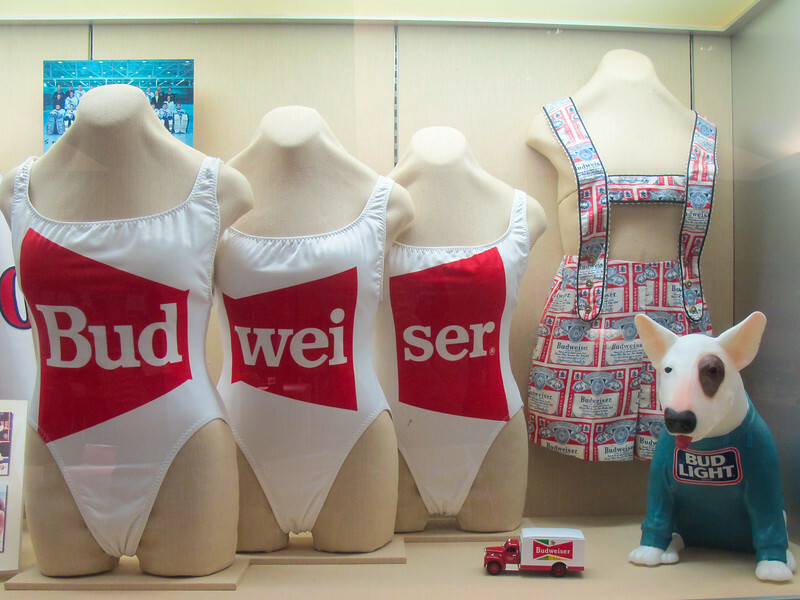 Yep, the beer folks let us meet at their facility and I kept sneaking around checking everything out. 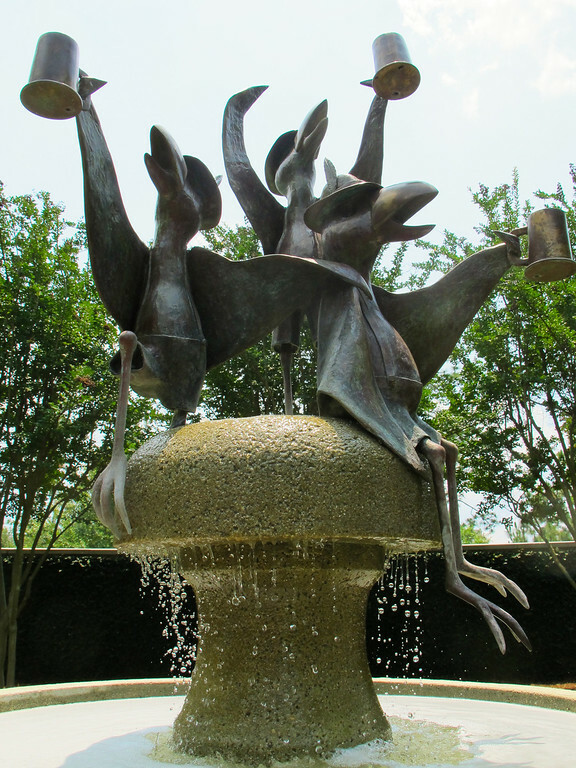 This bird fountain was in the yard. The luncheon was to celebrate the second year of the Corporate Volunteer Council in Charleston and Anita Zucker was the speaker. 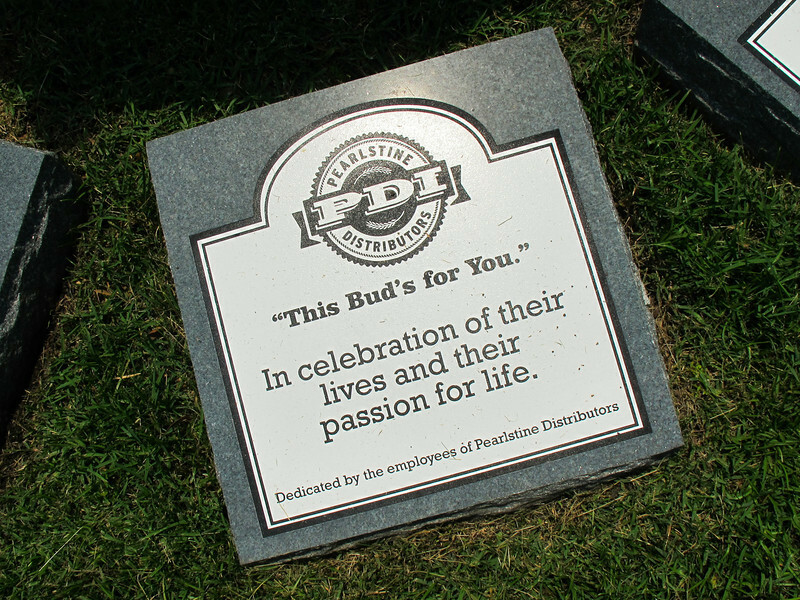 The people attending represented businesses whose employees volunteer and are active in the community. If that includes you, please do check out the web site and join the team! No clever stories this evening as I am nodding off at my desk. Yawn. 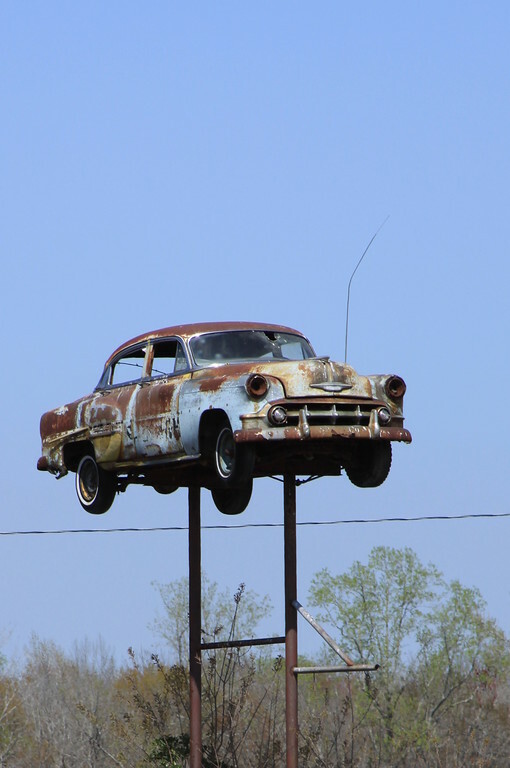 Here is a quick treat from my Backroads, S.C. album of the flying car. It's gone now but flies on forever in my photo. There is another one on Rivers Ave. that I need to capture before it vanishes as well. I brought home a bag of zucchini and squash from our on-campus Farmer's Market today and fried them up for dinner. So delicious. What a treat to have summer's gifts laid out right at work for us to buy thanks to Joseph Fields Farms on Johns Island. Avondale, Savannah Highway, Charleston, S.C.
Yep. That would be a mural of a highway on the side of the building. I was already to do the right thing and got tricked out of my walk by rain. Hmmmph. I'd never heard the word parkour until the two boys got stuck and picked up on the Cooper River Bridge yesterday. Now I can't stop clicking on youtube videos of kids leaping, running and bouncing off of buildings. The human body can do amazing things. Check out my lush green back yard. I've already bought a bird feeder and am enjoying visiting song birds. I scrubbed out my electric stove (blah...I love gas stoves) and made blueberry pancakes for brunch on Sunday. It was lovely and cool outside. 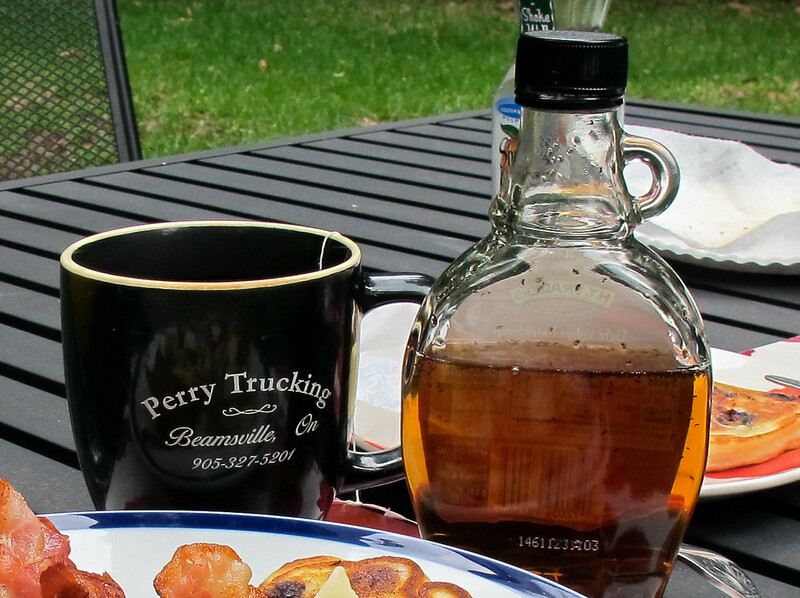 Zoom in for a close up below and check out the Perry Trucking mug courtesy of my brother Roger. I didn't spot the dark flecks in the maple syrup until after I'd gobbled up my delicious pancakes....yep, floating dead ants. Ooops! 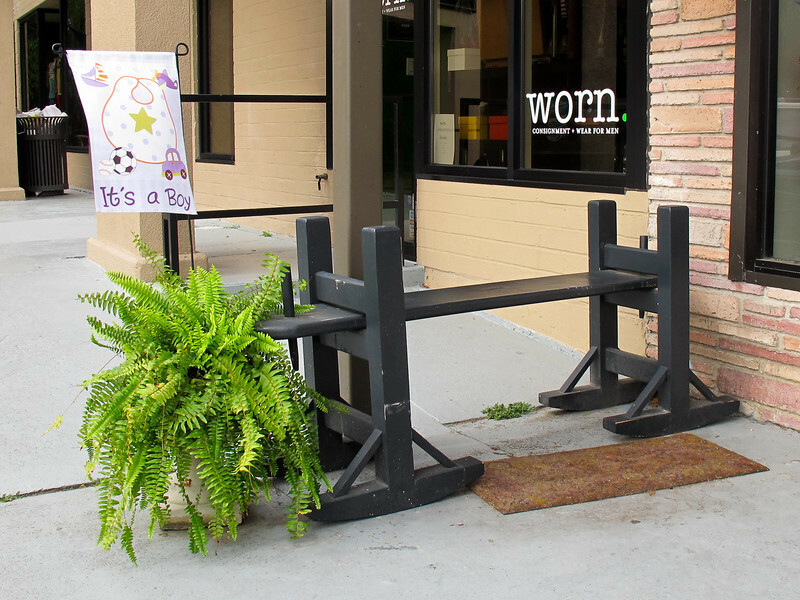 Peter & Sons Shoe Repair, South Windermere, Charleston, S.C. It surprises and makes me happy that we still have shoe repair shops. It reminds me that we don't throw everything out as soon as it is worn. Also, I really like hand painted signs and shoe repair shops seem to specialize in them. To find this one I walked all the way to South Windermere Plaza on Saturday morning to see how long it would take. I am finding all the places that are within reasonable walking distance of my new house. This would make more sense on a bike but I'll figure that out in good time. 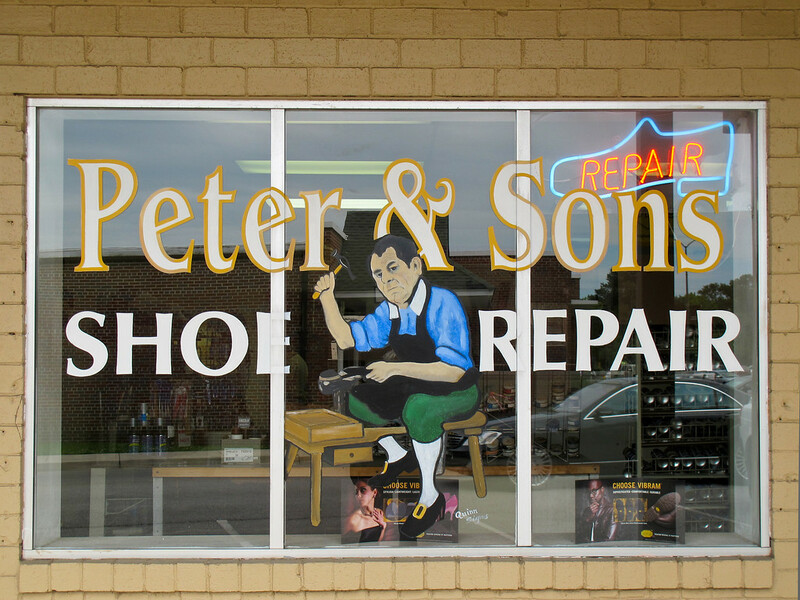 Peter must have quite a few sons because there is a Peter & Sons Luggage Repair Shop next door. Googling the company for the link I came across a Yelp website with a few good reviews and it made my blood boil yet again at the article I read recently about Yelp calling to pressure business owners into paying for them to remove negative ads. I do hope that isn't true. I've always enjoyed Yelp reviews. Near by I also spotted a mini me joggling board for Waldo! Cute. Soon I will be able to provide him with a map of every joggling board in the lowcountry and he can coordinate official tours. Sign on Hwy 27, S.C. He has a point, or two or three but I don't know what any of them are. Goodness. 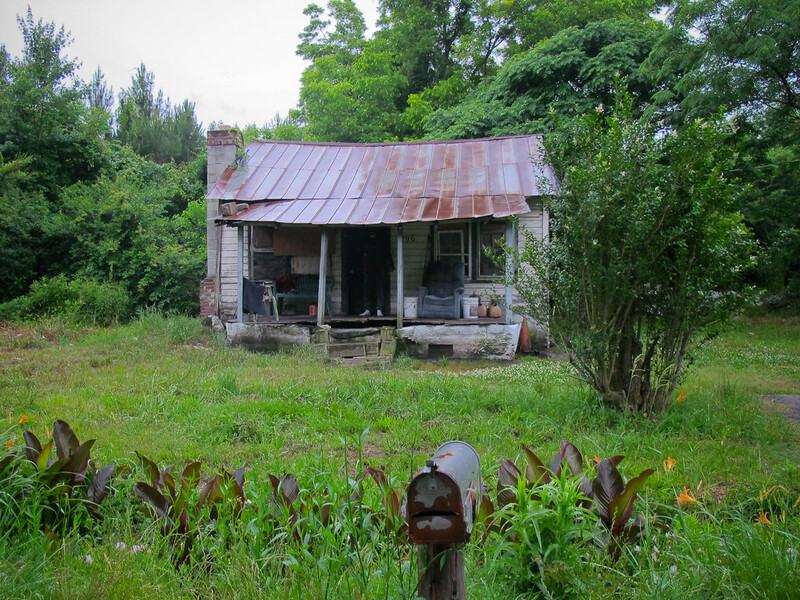 This took some effort and is right where Hwy 27 joins Hwy 176 in the lush and green back roads of South Carolina. 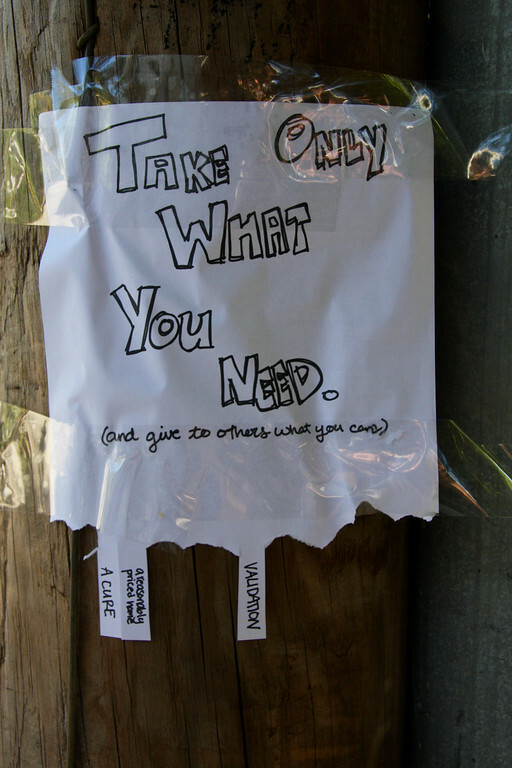 At least we can agree with "Adopt your own trash." Hope everyone is having a good Sunday. It is quickly slipping through our fingers. 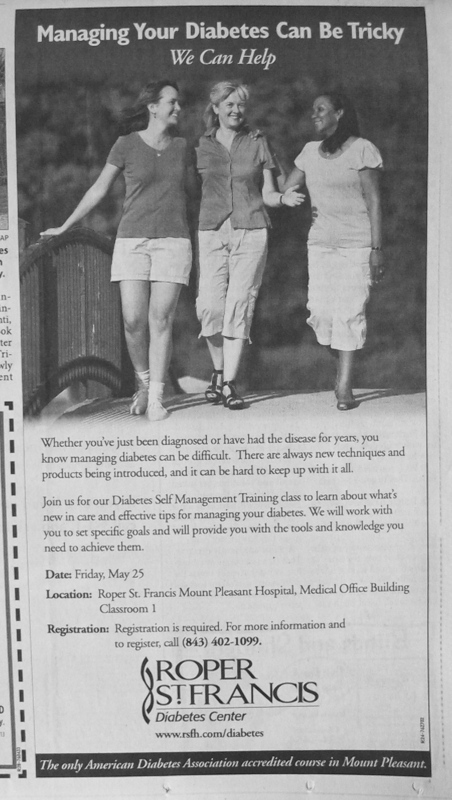 I opened the Post & Courier to discover that I had woken up with Diabetes. Luckily the Cadbury's Easter Egg season is over and I've been meaning to get a grip on my sugar weakness anyway. I may not have high blood sugar but I do have a sugar problem if it is something I really like. Recent studies show sugar makes you stupid. If I have any smarts left I will control myself. I can. So can you. 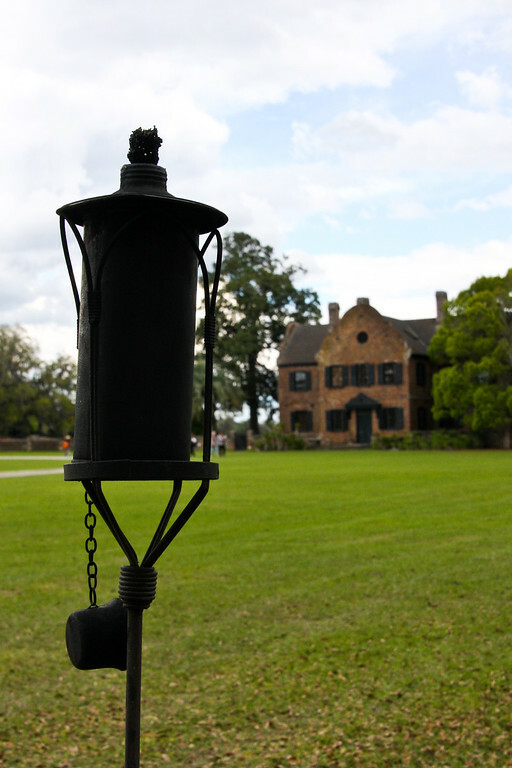 I've been at Middleton Place at dusk when these lamps are lit. It is a beautiful place at any time of year. 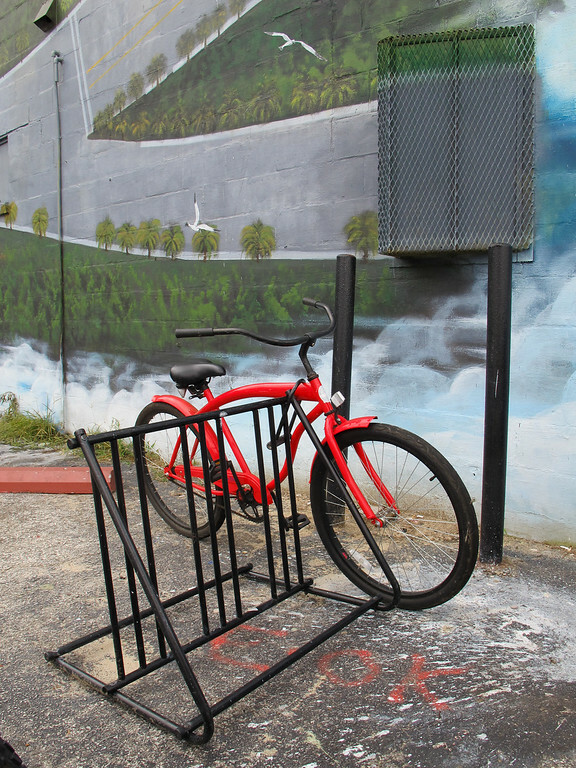 Continuing my West Ashley neighborhood dining adventures, I walked out the Bikeway to Wapoo Rd. the other evening coming back on Savannah Hwy and stopping to eat at the Early Bird diner. What a happy surprise! 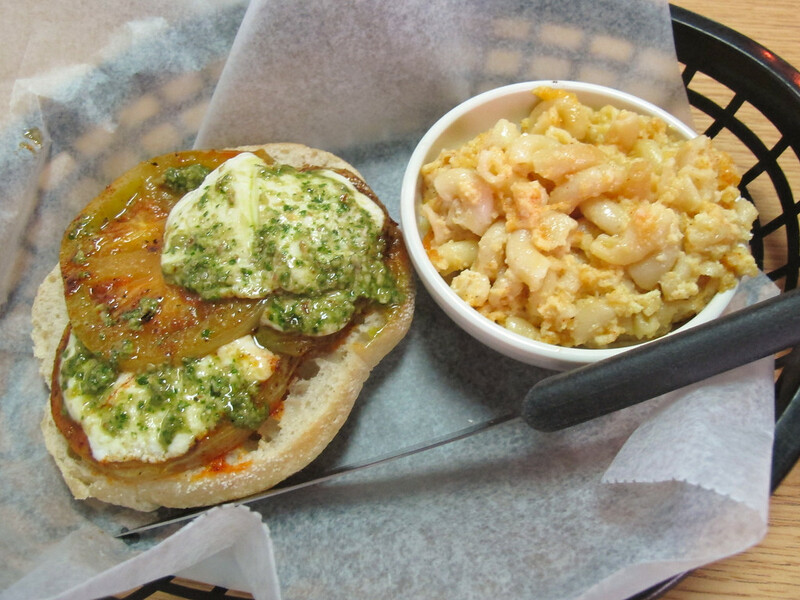 I had the blackened green tomato, fresh mozzarella and pesto sandwich and I think I've found my "thing". I tend to find one goodie that I keep going back for and this was delicious.Oh yum. I made it to my Friday matinee at the Terrace and saw the Sound of My Voice. So, I've gone to a movie, a walk and dinner out. No wonder I love Fridays. Have a good weekend kids! 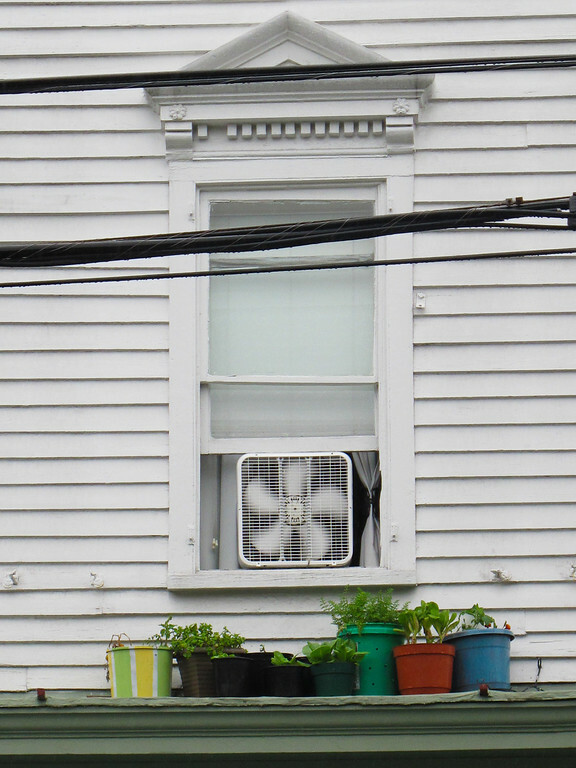 A few snips of fresh herbs can make all the difference to a meal and where better to have them than right out your window? I caught sight of this scene over Frampton's Florist on Wentworth St.
What a storm we had last night! I woke up to pouring rain around 3 a.m. and have to admit I lay there grinning with the realization that I didn't have to worry about driving through downtown flooding to get to work. Aaaah. Some trade offs aren't all bad. Friday is coming. What movie shall I see? 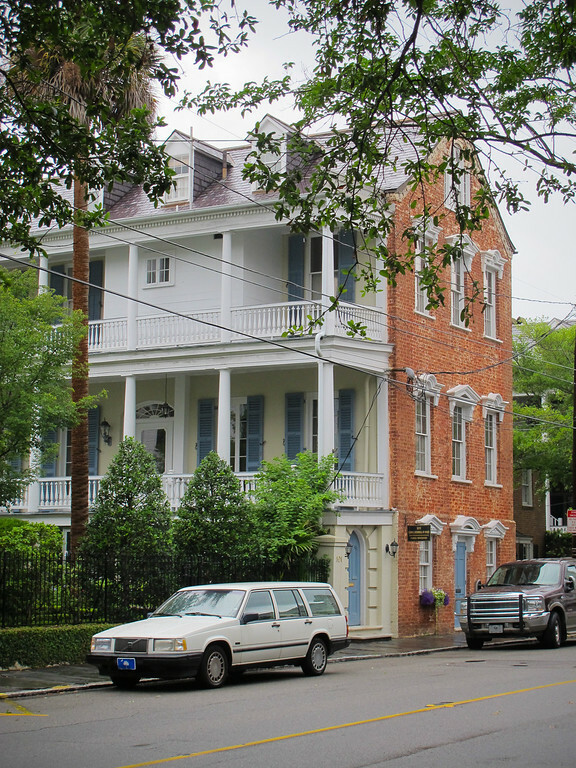 Dentist's Office, Rutledge Ave., Charleston, S.C.
Best looking dental office in town no doubt. I have no idea what the actual Dentist - Dr. John Horres looks like but what a beautiful building. It is great, isn't it? 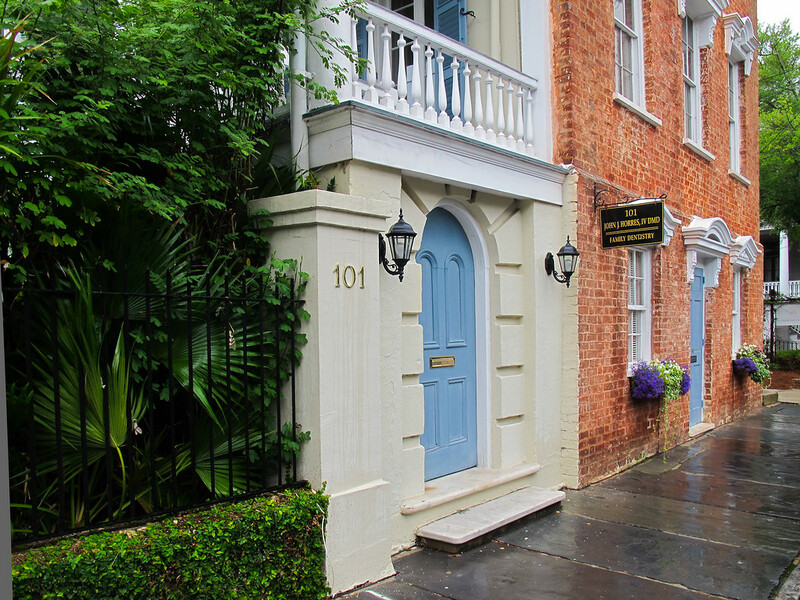 I love the blue doors and shutters against the brick. Bed time for me kids. G'night all. 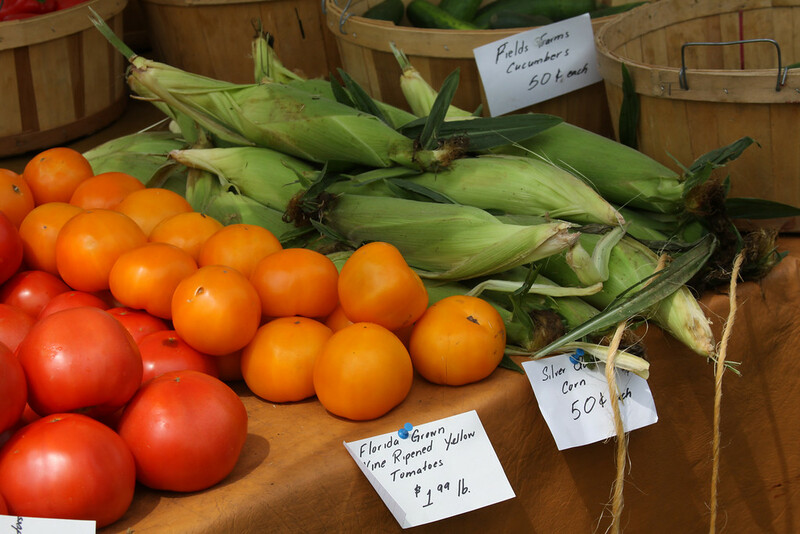 Lettuce, tomatoes and corn, oh my! Yipee! Joseph Fields Farms brought their organic produce to us. 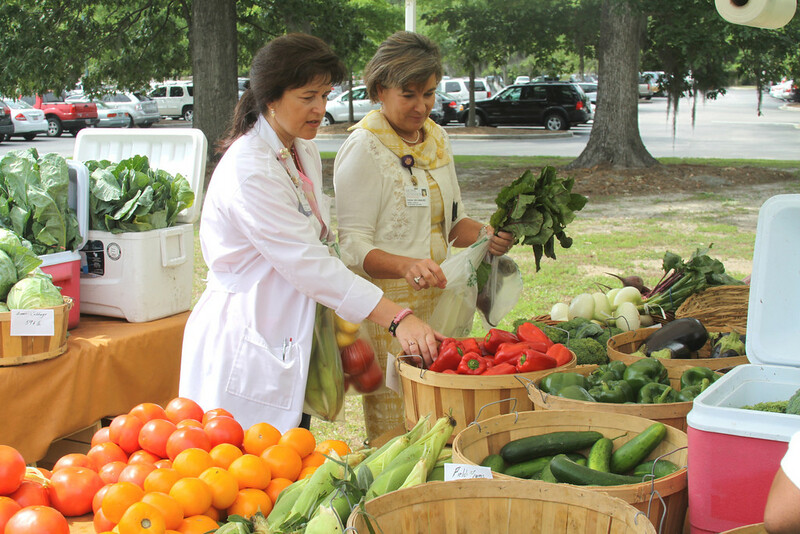 They set up a Farmer's Market booth right on the grassy lawn in our hospital parking lot so we could go home from work with fresh fruit and veggies. Happy day. Our vendor was completely blown away by the interest and didn't have a quiet moment without customers lined up until mid afternoon. He had to call for back up veggies to be delivered and by the time I left there wasn't much left at all. What a success. Luckily we didn't scare him away and we will have a regular Farmer's Market on campus every Wednesday. 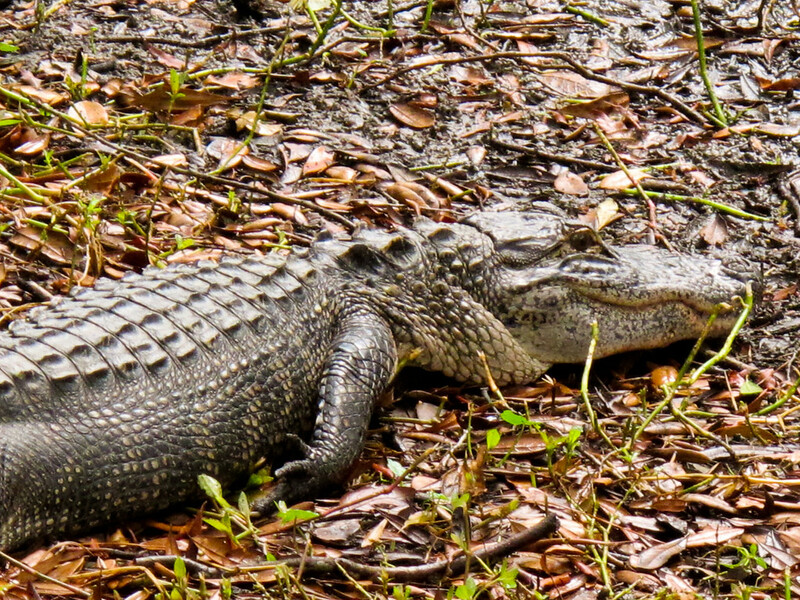 He promised local Johns Island tomatoes next week and I see Tomato Pie in my future. I worried about leaving all my neighborhood gourmet grocery stores when I moved West Ashley but I am not exactly starving to death. I've been checking out all the local places to eat. 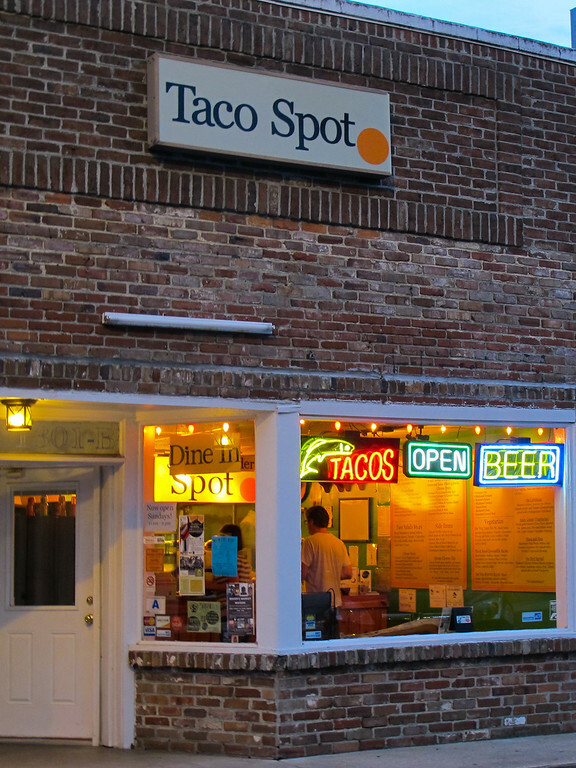 Last week I went to Al Di La (not impressed this time although I have loved it in the past) with my son and Sunday night I walked around the corner to Taco Spot for a tasty black bean quesadilla. It is a tiny spot! 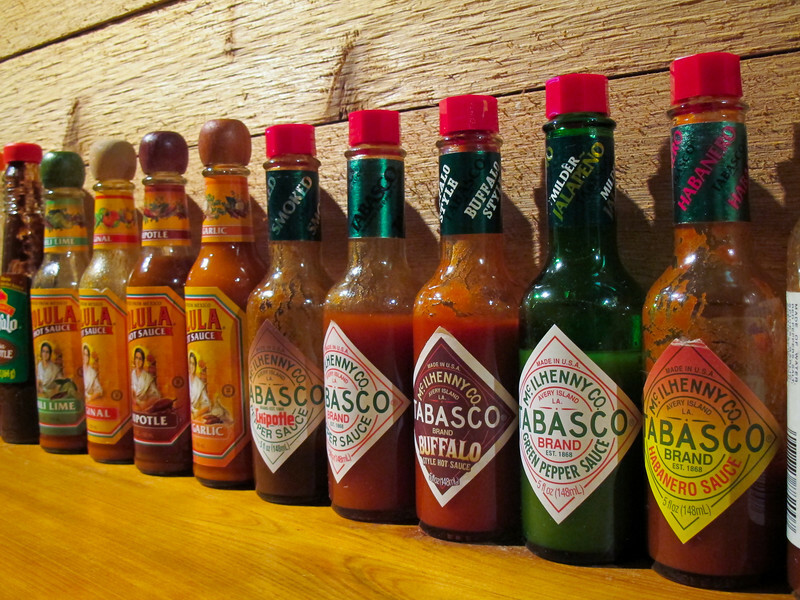 Hot Sauce at Taco Spot, Charleston, S.C. This evening I met my friend Susan and we ate at a picnic table outside at the Glass Onion. Check out this feast! I have half of it in a doggie bag for tomorrow. 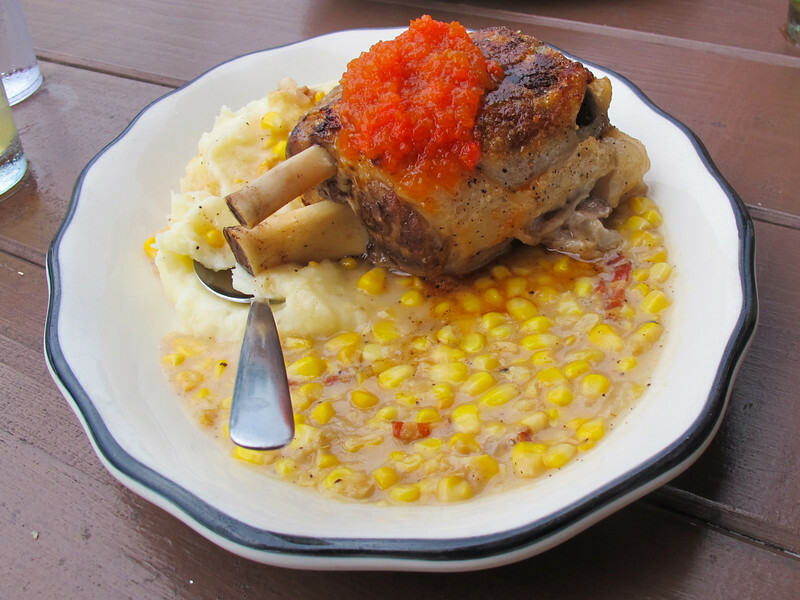 I just discovered that the Glass Onion has a blog and includes some recipes. Enjoy: The Glass Onion Blog. 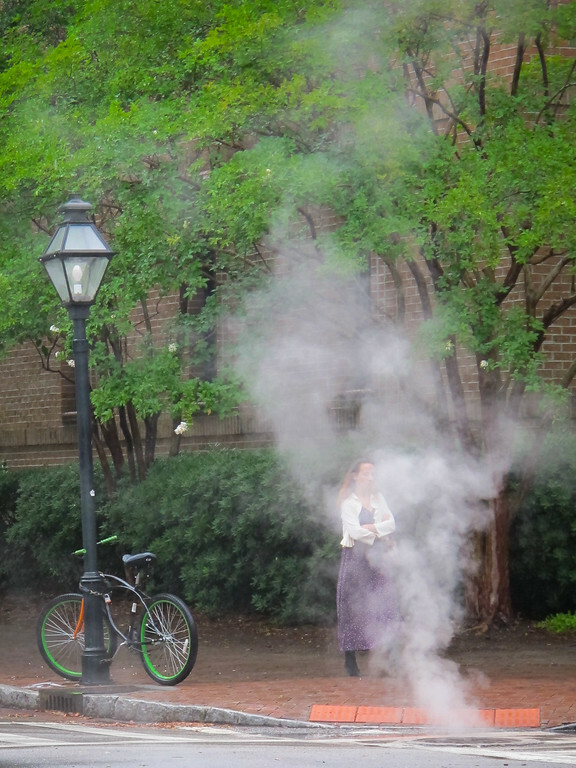 I waiting for the steam to blow in the right direction when the woman stepped into the scene and improved the shot. 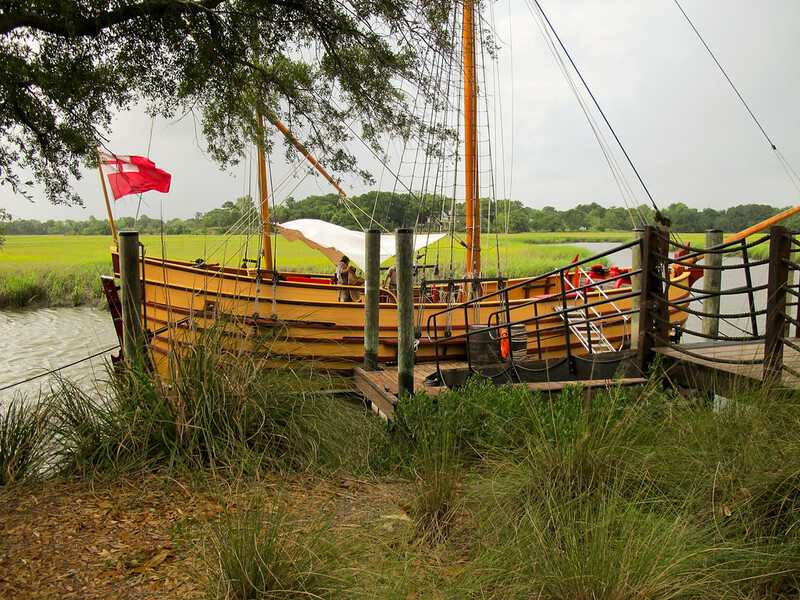 Check out VanessaK's photos of the Tall Ships in Savannah. Wow. Noah Moore wrote a lovely entry about his mother for Mother's Day. I love it when Cocktails in Charleston features a tilt shift photo in lieu of a cocktail. Good night kids. Someone turn the lights out. 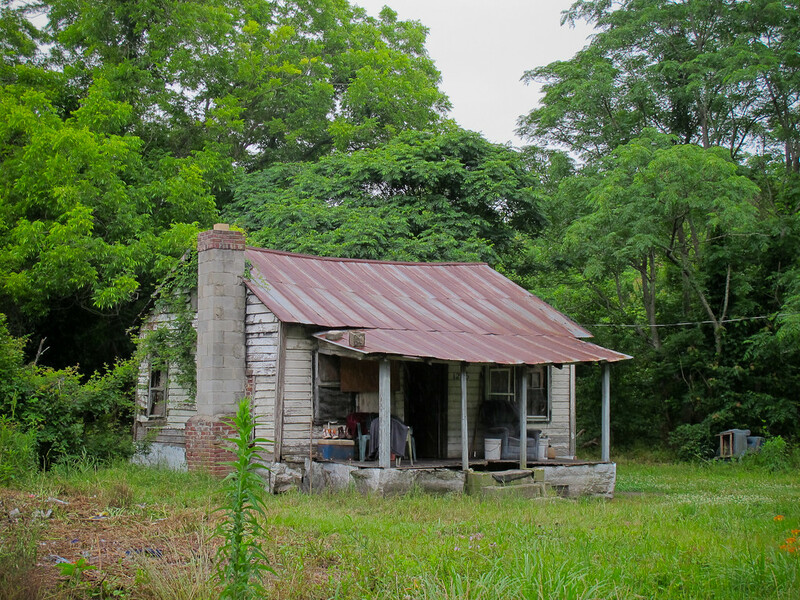 I love these little lowcountry cottages. I assumed this one was abandoned but after slowing down to get a shot I realized that it was occupied. Ooops. I tried to wave cheerfully and moved along. In other news I just caught the tail end of Chef Sean Brock on Anthony Bourdain's No Reservation. How exciting is that?! Pretty darn exciting :) Wish I'd seen the whole thing. 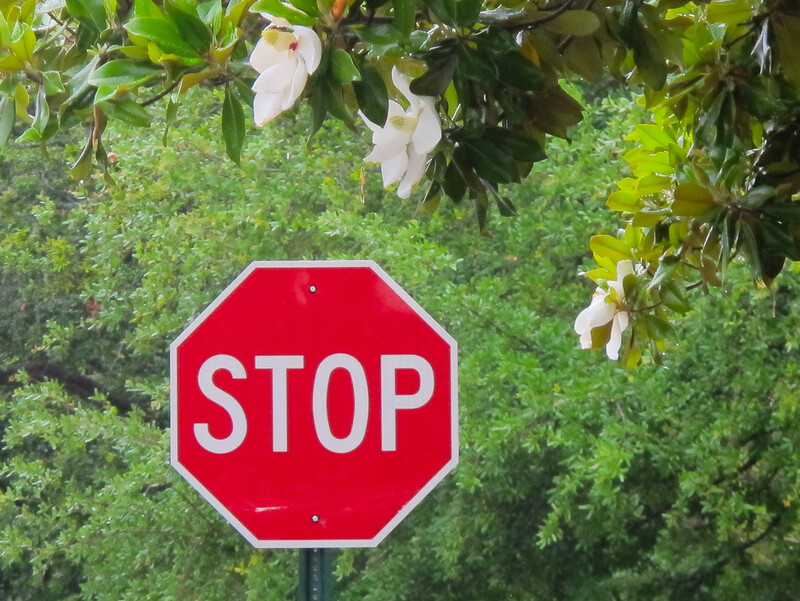 I thought this STOP signed lined up nicely with the blossoms and made a "Stop and smell the flowers" photo. 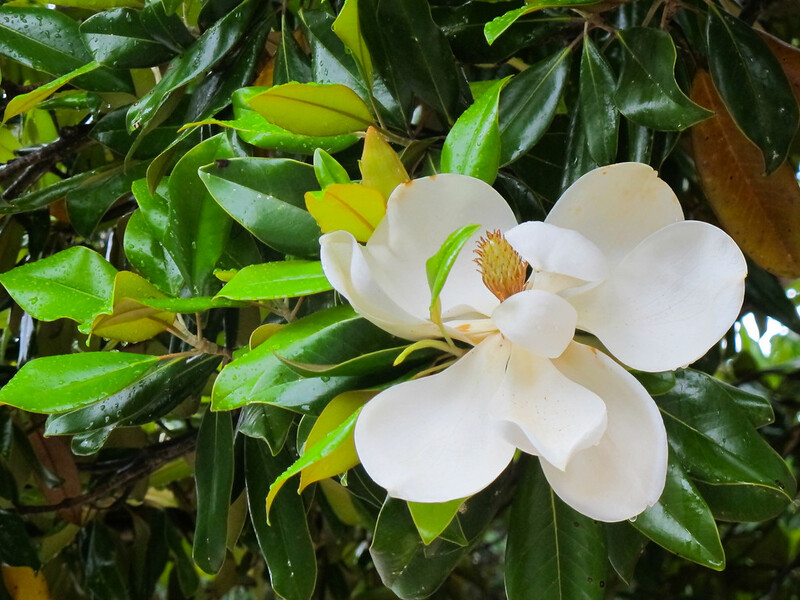 It looks like a good year for Magnolia trees in the lowcountry.